Cambs CC seems to have no money these days for footpaths, access etc. Some other organisations and individuals are doing what they can (now and in the past) for the environment and access. A few examples are described. With Spring coming on, it is time to visit the old churchyard nature reserve at East Hatley. The good news here is that the conservation charity, “Friends of Friendless Churches” (FOFC) are taking over ownership of St Denis, a grade II listed building, sited in the village at TL 285 505. The original St Denis was built in 1217, to be rebuilt in the C19th by the architect William Butterfield. The church had been disused for many years, and when we first knew it, the whole building was hidden in ivy. South Cambridgeshire District Council took over its care in 1985, when it was declared redundant by the Church of England, and a few years ago restored the outside of the building, leaving the interior a locked shell, presently a home for bats and cave spiders. Matthew Saunders, Director of FOFC has outlined plans to make the roof watertight, reglaze the windows and refloor the interior during 2017. The work has been made possible via a £60 000 endowment grant from South Cambs District Council. St Denis’ Church forms the hub of a knot of footpaths in East Hatley. From the village road, no fewer than 5 signed paths lead out to the main road, or towards New England Farm and Tadlow, or round Buff Wood. Parking is a bit difficult here, though, and is better in Hatley St George, where there are two laybys in front of the extensive rec, TL 283 509. The Willingham News of November 2016 gives details of new developments on the Ouse Fen. After the latest handover from the quarrying company Hanson, the nature reserve near Needingworth now extends to 218ha. Hanson plans to continue to donate small parcels of land to the reserve, as sand and gravel extraction is completed. By the time the quarrying is finished about 2030, the site may extend to 700ha. Needingworth quarry is the largest in Eastern England, and produces up to 1 M tons of aggregate yearly. Ouse Fen is already home to several rare wetland species. The article reports the presence of 8 male “booming” bittern, a species once on the point of extinction in Britain around the 1990s. Last Summer 8 young marsh harriers took wing. Great white egrets have been seen in the reedbeds, just beginning to colonise in the UK. The heronry at Berry Fen had 17 nests, and Barleycroft lake site housed nests of 559 pairs of black-headed gulls. (Are they sure there were exactly 559 pairs? Did they count them twice?) Otters and water voles have been recorded on fixed trail cameras. There are two places to park for access. From Over, drive to Overcote, with parking at TL 363 713 . A walk on the riverbank to the Overcote sluice gives access to the reserve. Or drive on the A1123 between St Ives and Bluntisham. Turn off near the quarry site entrance for visitors parking at TL 348 726. This Bourne Wood is not in Bourn, but is named after Cecil Bourne, who was chairman of CPRE in Cambridgeshire for 29 years, until his sudden death in 1990. His family wished to plant a wood in his memory, raising £1040, enhanced by a further £1000 from the Monument Trust. Cambridgeshire County Council provided tools and 2000 native trees and shrubs were planted in 1991. Today, the trees are quite tall, and already some thinning has been necessary. Park at the village hall, TL 475 651 and walk up Cockfen Lane. A gate on the left gives entry to the Worts Meadow Open Access Area, containing the moats which are all that remain of a medieval manor house. A display board gives interesting details. Continue to the next gate, which opens onto Bourne Wood. Paths and informal tracks give access to the boundary track and inner circular path round this charming little wood. Continue down Cockfen Lane, which shortly continues as the Roman Road, Akeman Street (eventually reaching Impington under the A14). Turn off right (W) at TL 466 639, to follow signed field boundaries round a circuit of young woodland, planted by the County Council, on County Farms Estate land. The circuit brings one past Rectory Farm, and back onto Cockfen Lane at TL 472 652, via a narrow treelined path from TL 468656. These two excursions together make perhaps 4 or 5 miles on permissive paths, in a parish which has very few rights of way. And private initiative and generosity were the key to Bourne Wood giving public enjoyment more that 20 years on. Alien is threatening the R.Cam ! Walk past the Grantchester Mill pond, or down the riverside towards Cambridge, and you will see it, lining the waterside in places. It is rather a pretty green plant, with indented circular leaves, and it is called floating pennywort. I have yet to see it flower, but it grows at a prodigious rate, up to 20 cm a day. It threatens fish and invertebrates, and other water plants, potentially chokes drainage, and could impede punts and canoes. Cambridge News quotes Jean Perraton Chairman of the Cam Valley Forum as saying there had been many attempts at clearance. If only one little piece is left, it can grow again (so mind you don’t inadvertently carry some elsewhere on your boots!). The Cam Conservators believe it is likely that clearance from the river will need to occur annually. Fleam Dyke:To cut or not to cut? Julia Napier writes in the November 2016 issue of the magazine of the Friends of the Roman Road and Fleam Dyke. The subject of debate is a so-called “radical” solution to the scrub lining the sides of the bank on the Fulbourn end of Fleam Dyke. Great Wilbraham Public Footpath 1 runs along the ridge of The Dyke, from the end of Stonebridge Lane, Fulbourn, to Mutlow Hill, and the tall steps over the A11, to continue into Balsham. This raised spine in a quiet countryside gives some of the best views in the area, as well as opportunities to enjoy chalkland plantlife, butterflies and birdlife not found in the adjacent arable fields. Some clearance of the Dyke at the Fulbourn end was made over 18 months ago, and was very raw and muddy at first, but the area has recovered. Now however, Heritage England have proposed extensive clearance of the scrub , with re-seeding of the slopes, in order to re-introduce sheep grazing. In Jan-Feb 2017, the fosse or ditch will be cleared to allow machine access. Access windows will be cut upward through the scrub and the upper band of scrub will be cut all the way along, with a plan to remove 80% of the scrub in 2 years. There is also a plan to strip plants and soil from the path on top of the dyke, down to the ditch. (My comment here is that this will make a good path horrible for the duration! Is it legal to destroy the surface of the right of way (other than in an arable field?) Cut surfaces will be treated to prevent regrowth, and areas reseeded with Upright Brome grass and perhaps Sheeps Fescue. The plan is likely to cost £100 000, 80% of which will be paid by Natural England. Historic England may supply the rest. The article goes on to consider the damage this plan could do to wildlife. The clearance will remove many of the bushes visited by the Green Hairstreak, one of two notable butterflies recorded in regular butterfly counts. The scrub is used by birds, and in any case it was the opinion of some experts that it would return, as has happened on a section of Devils Dyke, cleared some years ago. There is no comment made regarding the effect on the enjoyment of walkers on this very well-used, much loved route. I am sure Julia Napier would appreciate correspondence. Cantab usually appears about 4 times yearly. A large number of you now receive Cantab by e-mail. If you would like to receive an issue by post, please send a large SAE. Offers of brief articles will be gratefully received. Cantab88 © Janet Moreton, 2017. To formalise the current route of Footpath 7 from Hay Street to Brook End. 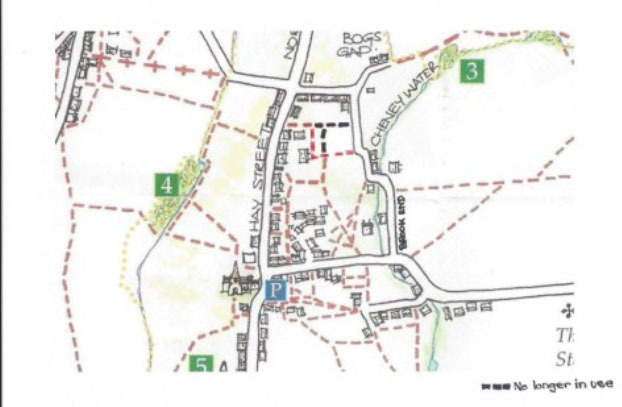 The County Council have agreed that they are prepared to cover the cost of the alteration to the definitive footpath map for footpath 7, from Hay Street to Brook End. We need to raise approx. £500 to cover the cost of the legal notification. We already have a number of pledges, now we are asking all those in the Parish who enjoy the use of the paths to please donate whatever they can to this fund.